Add elegance to your home with a gorgeous embroidered gold floral table runner. It has a beautiful Thai traditional floral, vine trim with adorable yellow tassel on each end. This elegant runner is a thick, silk-like, 100% polyester fabric which is light weight and durable. It is perfect as a decorative centerpiece on your dinning or large coffee table for any special occassion including Thanksgiving, Christmas, Easter or dinner with friends and family. It is excellent as a bed scarf runner for the foot of bed and will fit both queen and king size. Creates luxury in a guest room, hotel, or spa. Ideal as a bohemian tapestry wall hanging in an office, living room, yoga studio or meditation room. Great gift idea for a wedding, birthday, anniversary, housewarming and all occasions. Measurement : Approximately 76" long and 19" wide with 3" tassle on each end. Care instruction: Machine wash at delicate cycle. Do not bleach. Do not tumble dry. Iron at low heat. Dry clean. Hand wash. Ships fast from USA. 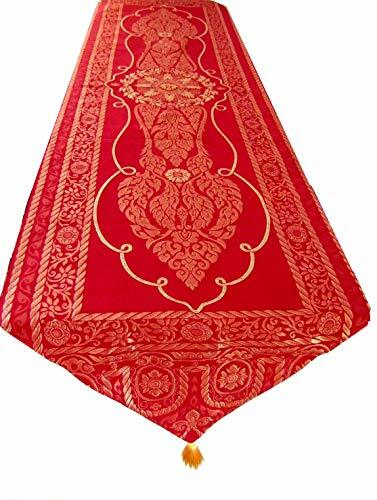 Decorative red table runner has an intricate weave of a vine and leaf pattern in a royal gold color. Ideal as a bed scarf for foot of bed or a table runner for any holiday table setting, Christmas, Thanksgiving, Hanukkah, Easter, or just as an elegant table centerpiece. Approximate size: 76" long x 19" wide with one 3" tassels on each end.